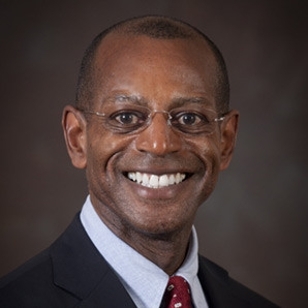 James Wimbush, Indiana University vice president for diversity, equity and multicultural affairs, presented an annual 2015-16 diversity report at the IU Board of Trustees meeting this week that shows IU is making progress in its system-wide effort to pursue diversity and inclusion. The report developed through the Office of the Vice President for Diversity, Equity and Multicultural Affairs reveals the strides IU has made toward its goals of increasing recruitment and retention of minority faculty, staff and students; promoting a welcoming and positive campus climate; and engaging in outreach and advocacy locally and nationally. 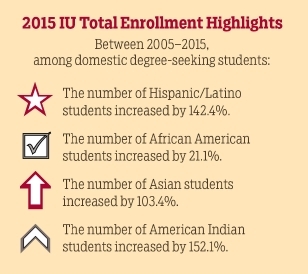 According to the U.S. Census Bureau data captured during the fall 2015 semester, the percentage of minority students at IU rose from 13.9 percent in 2005 to 22.1 percent in 2015. This includes a 142.4 percent increase in the number of Hispanic/Latino students, a 21.1 percent increase in African-American students, a 103.4 percent increase in Asian students, and a 152.1 percent increase in American Indian students. "This is a tremendous achievement -- and confirmation that we are indeed strengthening our impact and successfully moving the needle on diversity," Wimbush said in the report. In addition to the enrollment data, the report also highlights IU’s recent efforts to cultivate an institutional climate of respect and a place where students and employees feel valued and have the opportunity to succeed. Some of those highlights include a $1.6 million grant from the Office of Naval Research to train diverse STEM researchers at IU’s core campuses; a new scholarship in recognition of IU’s first African-American female student, Carrie Parker Taylor; and IU’s participation in both the Indiana Black Expo’s Summer Celebration and the Indiana Latino Expo. "I am confident that with the necessary framework in place and an unwavering focus on the areas of recruitment and retention, climate, and outreach and advocacy, IU will achieve even greater progress in creating an inclusive learning and working community the future," Wimbush said in the report. "And I will have the privilege of detailing those achievements in next year’s diversity report." The annual diversity report also includes information specific to the IU Bloomington, IUPUI, IU East, IU Kokomo, IU Northwest, IU South Bend and IU East campuses. It shares information about the community programs and culture centers of the Office of the Vice President for Diversity, Equity and Multicultural Affairs, as well as an information from an assessment report conducted by Halualani and Associates. Wimbush gave the report during the first meeting of the Board of Trustees Student Relations Committee. The newly formed committee provides the board an opportunity to hear and learn from the student body about student-led initiatives, programs, and strategies on all campuses. The committee also reviews student welfare initiatives and any governmental or agency reports related to student life.